Moving (residences) much easier thanks to Carrie's coaching! lost 3.5" from the waist, 4.5" from the hips, and 24 pounds! I train clients in their homes (and in pools if available) and at 2 clubs in downtown Denver (Club Form and Dumbbells Too). 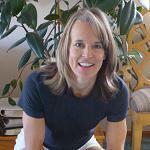 I offer yoga training, some yoga therapy, strength and conditioning, endurance, flexibility, and balance training. I have experience working with hip replacements, post-rehab. clients (including back sugeries), the elderly, psotural dysfunctions, cancer patients, prenatal, recreational athletes, and more. I make exercise enjoyable for my clients!